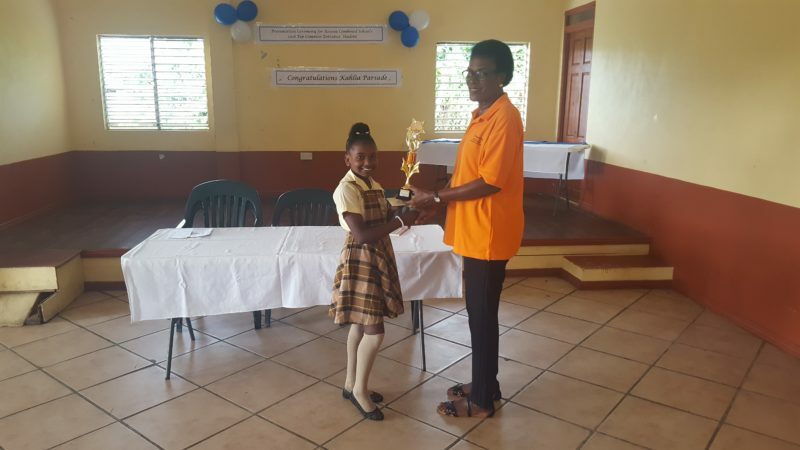 PRESS RELEASE: The Morne Ciseaux, Bois d’Inde, Morne d’Or, Jacmel (MBMJ) Development Committee for the second year in a row held a presentation ceremony in honour of the Roseau Combined School’s top Common Entrance Student. This year’s top performer Kahlia Parsade hails from the community of Bois D’Inde, Jacmel. The ceremony took place on Saturday, August 11, 2018 at the Jacmel Community Centre where the student received a donation of $500 and a trophy. The Committee’s Public Relations Officer, Mrs. Virginia Charles noted that whilst the NGO is a not for profit generating entity it realized the need to honour the student and recognise her achievement within the community. This would also serve as a motivating factor for other students to continue to aim higher in the future. The Committee’s President- Patrish Lionel, congratulated the student and encouraged her to continue persevering. Her grandfather, Primus Hutchinson, was also present and gave some brief encouraging remarks and thanked the committee for this initiative. Mr. Hutchinson stated that Kahlia is a quick learner and was no doubt surprised when she topped her school at this year’s examinations. The Morne Ciseaux, Bois d’Inde, Morne d’Or, Jacmel Development Committee again wishes to congratulate Kahlia on her achievement and wishes her a successful tenure at the Saint Joseph’s Convent. Kahlia joins Leah Jones who was the top performer for the examinations in 2017 at the Roseau Combined School. The Committee hopes to continue initiatives such as this as it embarks on development projects within the communities it serves.